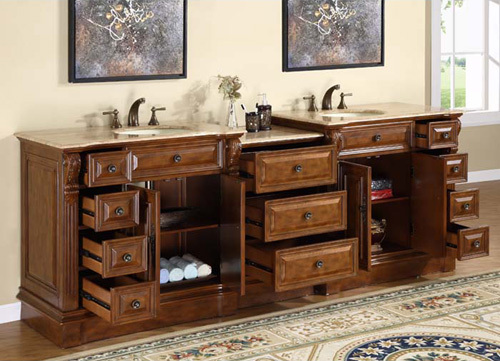 The Soprana Double Bath Vanity is a handsome addition with a traditional look that never goes out of style. 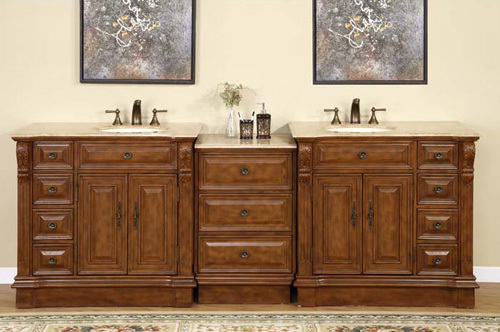 This double vanity is hand crafted with intricate beveled details and hand painted for its rich finish. The Roman Vein-cut Travertine is pre-drilled for easy faucet installation and includes double ivory ceramic undermount sinks. Eleven drawers and two double door cabinets provide ample storage. This unit provides plenty of counter space, making it perfect for couple to do their routines.